(Christiansted, St. Croix, USVI)- The St Croix Yacht Club, situated on the sensational sandy beach on Teague Bay in St Croix, USVI, just completed its popular St Croix International Regatta last weekend. The event takes place over three days. On Friday March 8th was Capt Nick's Race; a salute to Captain Nick Castruccio "Tail Hook Nick" and sharing his life long passion for racing and the sea. Then, on Saturday and Sunday, it was International Regatta, two days of fun, fast and exciting mix of CSA handicap racing for the whole family. The fleet enjoyed an array of courses set in picturesque Buck Island channel. In the CSA Spinnaker class, Peter Stanton’s J/24 CRUCIAN CONFUSION all four races in the Capt Nick’s Race and five of the six races in the Regatta, winning class quite convincingly. Mirroring those scores all three days was Mackenzie Bryan’s bright red J/100 BAD GIRL, with all 2nds and one 1st to take the silver. 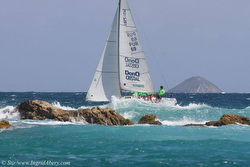 For more St Croix International Regatta sailing information Add to Flipboard Magazine.